In earlier blog’s (Part I and Part II) I’ve discussed evidence for the British Type I Victory Medal and the manner in which one could identify Type I Victory Medals. In those blogs it was established that by mid-1920 at least 33,190 Type I Victory Medals were named with 190 already issued and 33,000 packed and ready for issue (Figure 1), but there is currently no way to determine how many of those 33,000 medals were actually issued or whether even more were produced and issued. Previous blogs have also established that Type I Victory Medals were issued through the year 1920 and that the first Type II Victory Medals began to be issued in the first week of January 1921. It was also established that some recipients of the Type I Victory Medal returned their original medals to have the dark-chocolate color lightened and the suspension strengthened (the Type IR Victory Medal). Figure 1: Numbers of Type I Victory Medals manufactured, issued and ready for issue in mid-1920. Recently the medal rolls for the British War Medal and Victory Medal, 1914-19 were released on www.ancestry.com. The officer rolls are by regiment and indicate the name, rank and date of issue of the medal (Figure 2) which allows one to determine the officers who were issued the Type I Victory Medal. These rolls also indicate those officers who returned their Type I Victory Medal for refurbishing by 31 December 1920 and were reissued a Type IR Victory Medal. Those who returned their Type I Victory Medals after that date were issued a Type II Victory Medal. Figure 2: A page of the British War Medal/Victory Medal roll for officers on the staff that shows the officers’ names, rank and date of issue of the Type I Victory Medal, and also indicates those who returned their Victory Medals for refurbishing and were reissued Type IR Victory Medals. The huge number of Victory Medals issued during World War I makes an examination of all of the rolls for that medal an extremely lengthy process, even if only medals to officers are being considered. The author decided to limit his examination of the rolls to a small group of regiments which will allow a relatively accurate representation of the percentages of Type I and Type IR Victory Medals issued to officers relative to the total quantity of that medal issued to British officers. The rolls were first examined to determine the total number of Victory Medals, Type I, and Type IR Victory Medals that were issued to officers of six cavalry units (Table 1). While the percentage of Type I Victory Medals issued varies for each of these cavalry regiments, it only varies six percent on each side of the average for all the cavalry units examined. The percentage of Type IR Victory Medals issued varies considerably with no officers receiving that variety in half of the cavalry units examined. Table 1: Victory Medals awarded to officers of cavalry units. Then the medal rolls for the Victory Medal to 17 British infantry regiments were examined (Table 2). Note that except for three of the regiments examined, the number of Type I Victory Medals issued to officers is rather consistent compared to the average, but, as with the cavalry, the percentage of Type IR medals varies considerably with almost a third of the regiments having none of that type issued to officers. Table 2: Victory Medals awarded to officers of British infantry units. Finally, the rolls of Victory Medals to officers of the corps (Royal Artillery and Royal Army Ordnance Corps) and to officers on the Staff roll were examined (Table 3). For the officers of the various corps the number of Type I and Type IR Victory Medals awarded to officers is fairly consistent except for the Royal Horse Artillery (RHA). The officers on the Staff roll, though, were issued an abnormally high percentage of Type I Victory Medals relative to the total number of Type I Victory Medals to officers of the cavalry, infantry or corps, probably due to the large number of high-ranking officers on that roll. Table 3: Victory Medals awarded to officers of corps and the staff. 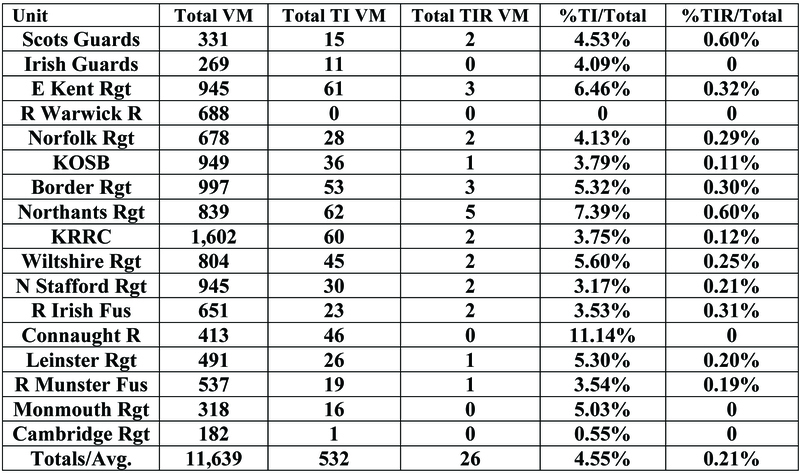 Table 4 summarizes the data from the first three tables representing 37,451 Victory Medals awarded to officers of the units and staff that were examined in this study. Note that the percentage of Type I and Type IR Victory Medals relative to the total number of Victory Medals issued to officers of these units is quite consistent for officers of the infantry and corps units, but the number of those medals issued to officers of cavalry units is over three times higher and the number of Type I medals issued to officers on the Staff roll is over six times larger. 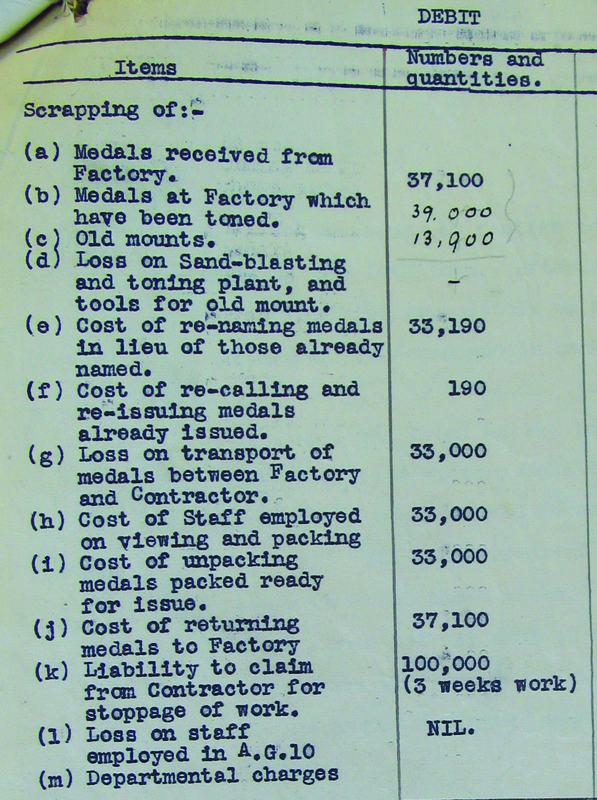 The totals for all 37,451 Victory Medals issued to the officers considered in this study is shown with the number of medals issued to staff officers included, and removed. In Table 4 the percentages of both Type I and Type IR medals issued to the Staff is much larger than the total number of Victory Medals issued to officers of the cavalry, infantry and corps. 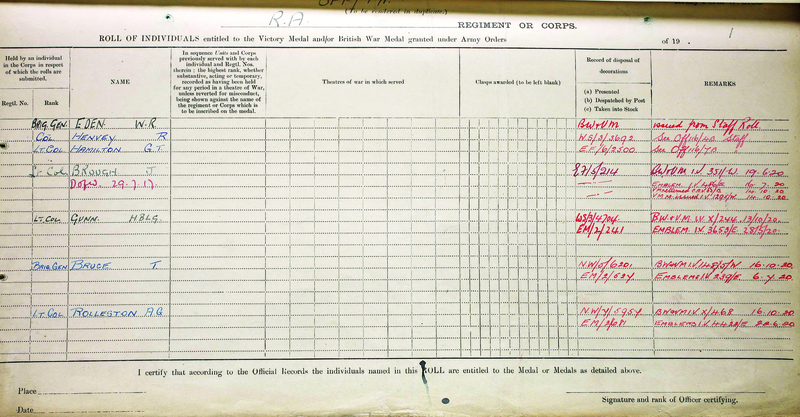 Therefore, the totals in Figure 4 that do not include those on the Staff roll is probably a more accurate estimate of how many British officers received Type I and Type IR medals, because the effect of the large number of medals issued to the staff will diminish as data from more medal rolls to officers are added to the current data. Table 4: Victory Medals awarded to 37, 451 British officers.